13.03.2011: Updated the code and made it easier to use by referring jQuery and jQueryUI from Google. The plain text multi lines are no problem, but the rich text and enhanced rich text ones are a bit tricky. They are made up of <IFRAME>’s, and the input does not go in a <textarea> tag. 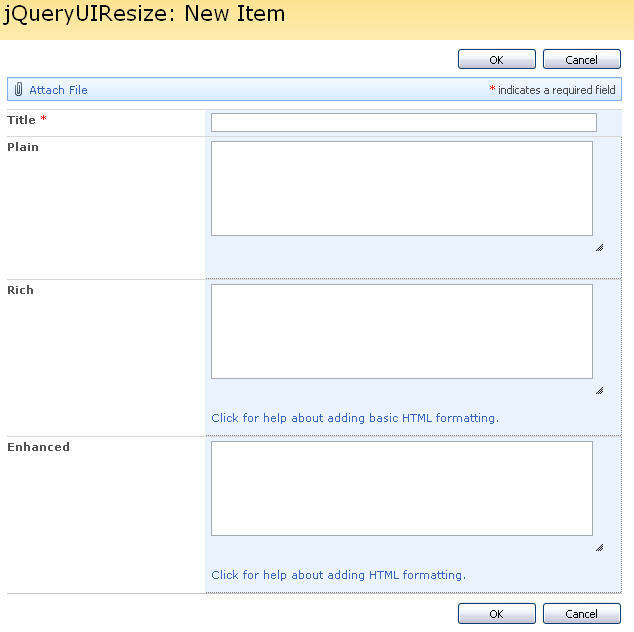 I have made this solution based on the jQuery UI “Interaction” Resizable. I knew you would be the one to figure it out. You are the master. Great job! Is there a way to set a default size of a field or multiple fields? Using another script to prepopulate the rich box I find the table I populate seems hard to read because of the limited space. Once the field is resized larger it looks fine. can this value be set or predefined? This code sets a field with FieldInternalName of “EnhancedRichText” to height=500px and width=600px. Hi Alex. 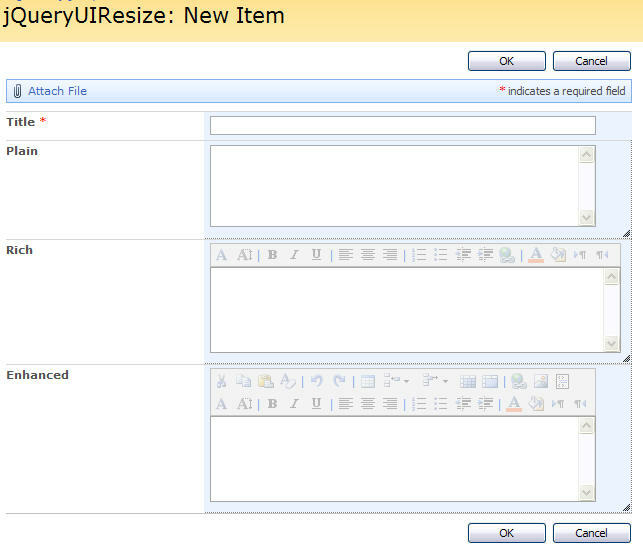 How can I use it on SP2013? Try this code – replace “MultilineRich” with your field name and adjust the size to your liking. I want to be able to resize a multivalue lookup field. Thanks for that amazing post……… Can I set the default font size in this RTE to be more that what it is now……… overriding the style (.rtelong) does not work….. for font formatting alone……… other properties like width, height etc can be formatted………. Thanks a lot in advance…………… quick reply appreciated……….. The FieldInternalName of “my” field is “MultiLineRich”. thank you for all this useful tutorials an scripts at first. I tried out the Resize script with a MOSS 2007 German but it does not work. No error message in the IE status bar. Do you have any idea what mistake I am doing? I have made some changes in the code – see if that helps, and ensure your CEWP is placed below the form.